Sign-up to M and M Direct Newsletter for Special Offers! Whether you are looking for a new smart shirt, a casual t shirt or some snazzy sportswear, you'll find top brands at rock bottom prices here. Save big on men's clothing, footwear and accessories from great names like Adidas, Ben Sherman, Calvin Klein, Firetrap and many more. Where do I use my M and M Direct voucher code? Choose a deal from Netvouchercodes and follow the link through to M and M Direct. Browse the website and add any applicable products you want to your basket. Click to check-out and then sign in. Your discounts will already be applied to your basket total. With millions of customers worldwide and the largest market share for outlet fashion in the UK, you can rely on M and M Direct to supply you with affordable high-end clothing, footwear and accessories. The brands you can find at M and M Direct include household names like Adidas, Nike, UGG, Timberland, The North Face, Diesel, Ted Baker and much more. 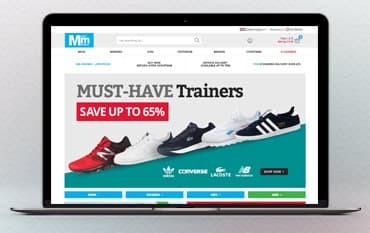 Discover casualwear such as t-shirts, tracksuits, hoodies and loungewear, sportswear and outdoor clothing such as coats and jackets, boots and swimwear, as well as an array of accessories to match, all on the M and M Direct website. For even more savings you can shop the clearance section which has plenty of bargains for men, women and kids and enjoy free express delivery on your order. If you’d rather have something in person to browse you can request a catalogue from M and M Direct. With this handy catalogue you can- not only enjoy a huge selection of products- but also enjoy great offers and deals delivered straight to your door. M and M Direct are named after its two founders, whose first names both begin with M: Mark Ellis and Martin Churchward. They originally started the business in the late '80s with the idea of making big names brand’s clearance products more readily available to the public, and as online shopping began to take hold, they were able to grow M and M Direct into one of the biggest designer outlet retailers on the internet. Score a goal in style this season with a pair of new football boots. Find huge savings on top brands including Adidas and Nike and combine function and fashion with your next pair of football boots. It’s essential that the boots you buy aids performance and comfort, both on and off the pitch, which is why it’s best to buy from a big name brand that you can trust. And doing this doesn’t require spending a fortune either. With M and M Direct you have the luxury of buying expensive boots for a great low-cost price, with up to 75% off across the store. So, whether it’s men’s, women’s or children’s football boots you’re looking for, you can find them all for less at M and M Direct. Converse are a great footwear option for everybody. With a laid-back, casual connotations, and a name synonymous with basketball, you can wear Converse trainers for comfort during the day and for support during sporting activities. Check out the wide range of Converse trainers at M and M Direct, with sizes available for men, women and kids. Choose from a huge array of colours and designs, ranging from the classic block colour All-Stars style to the more contemporary leather looks. Whether it’s low rise or hi-top, these sneakers never go out of style, and with low-cost price tags available on all, you can stock up your collection of Converse without breaking the bank. You have 28 days to return any unwanted products to M and M Direct. At Christmas time you can enjoy an extended Christmas returns policy that changes every year. Post: MandMDirect Ltd, Customer Contact Centre, Clinton Road, Leominster, Herefordshire HR6 0SP. If you love high-end fashion brands but don’t like the hefty price tags that come with them shop at M and M Direct. As an online outlet retailer, they can offer up to 75% off the RRP prices on dozens of men’s, women’s and children’s top fashion brands including Levi’s, Lacoste, Reebok, Diesel and Emporio Armani. You can discover clothing, footwear and accessories and also enjoy great price reductions, on top of M and M Direct’s already impressive costs when you shop online with a M and M discount code from us. We are constantly on the hunt for first order Promotion Codes for M and M Direct to help you with your money saving. Our experts check dozens of sites for secret codes including NHS discounts, student sites & social media channels saving you time & money!